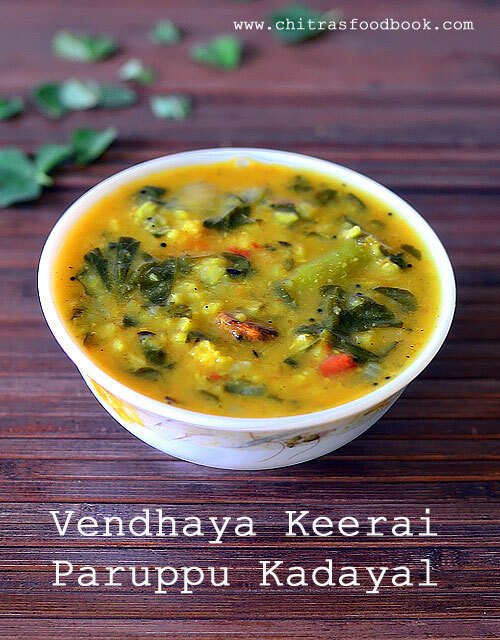 Today I have shared a South Indian version of methi dal called as vendhaya keerai paruppu kadayal in Tamil. 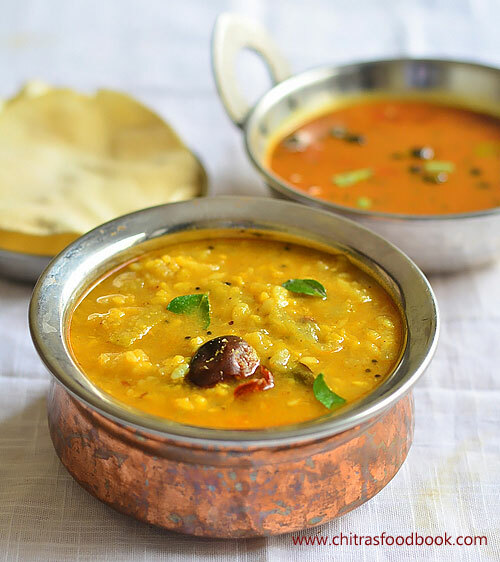 I learnt this easy, one pot dal recipe from my neighbor. Its a no grind recipe without coconut. Usually I make vendhaya keerai kootu using moong dal and ground coconut paste. When my neighbor shared this easy kadaiyal with similar ingredients like kootu, I got tempted to try it. We can mix this paruppu kadayal with plain rice adding ghee. It tastes yum. 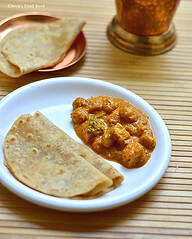 As it an easy recipe which can be prepared easily in a pressure cooker, bachelors and working women may find it helpful to cook easily during busy morning hours. Do try this easy vendhaya keerai paruppu and let me know your feedback. Wash the fenugreek leaves and set aside. In a pressure cooker base, take the dal, leaves, chopped tomato, onion, garlic cloves and chilli powder. Pressure cook in very low flame for 2 whistles.Mash the dal completely. Temper all the ingredients and add to the dal. Mix well. Serve with plain rice adding few drops of ghee. Wash and clean the fenugreek leaves. In a pressure cooker base, take moong dal, washed fenugreek leaves, chopped tomato, onion, garlic cloves, slit green chilli, chilli powder, salt and turmeric powder. Cook for 2 whistles in low flame. 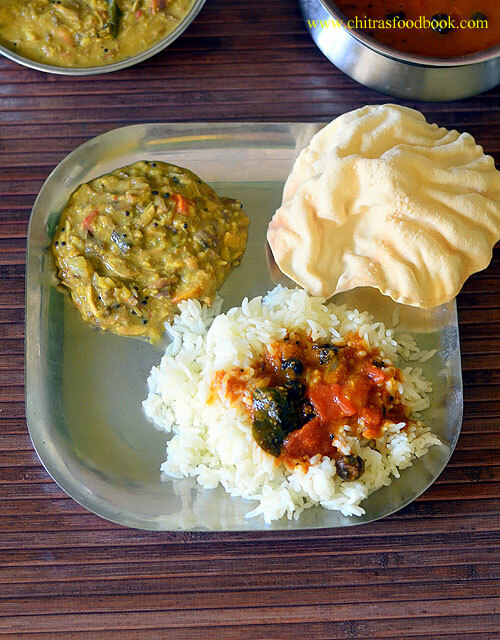 Alternatively you can pressure cook dal and remaining ingredients separately. For variations, you can saute the methi leaves in oil till it shrinks, then add to the cooker. Open the cooker after the steam is released. Mash the dal mixture with a whisk or ladle. Check for taste and add more salt if needed. In a small kadai, heat ghee. Splutter mustard seeds, cumin seeds, crushed garlic cloves and curry leaves. Add to the dal. Mix well and boil for few minutes till semi thick in consistency. 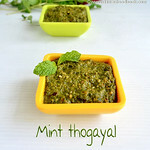 Garnish with coriander leaves and serve with plain rice adding few drops of ghee. Adjust the quantity of green chilli and chilli powder as per your taste. You can also saute the fenugreek leaves in little oil before adding to the pressure cooker. It helps to reduce the bitterness of fenugreek leaves. 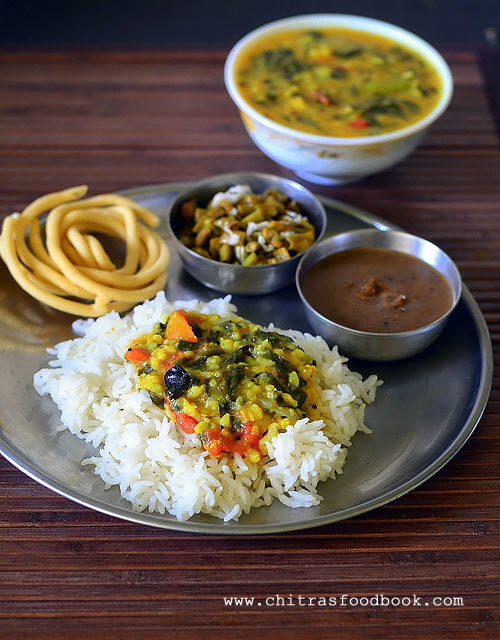 Try this easy, yummy , healthy methi dal at home and enjoy with rice. Peerakangai kootu / Peerkangai poricha kuzhambu/ Beerakaya kootu (In Telugu) / Ridge gourd kootu (in English) is an easy, one pot side dish for rice. 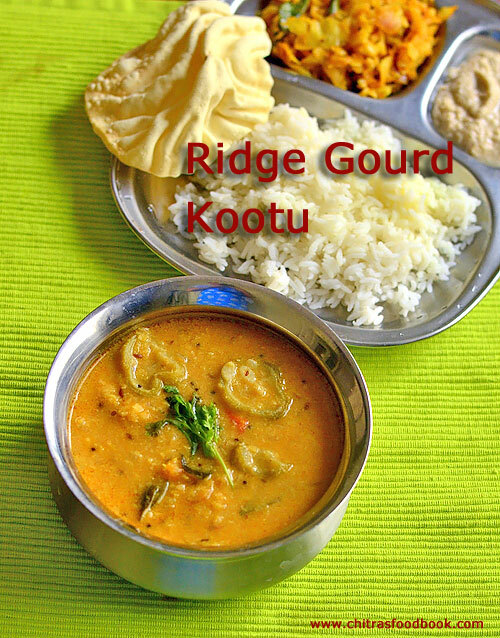 This ridge gourd kootu goes well with vatha kuzhambu and Kara kuzhambu rice. But we love to eat this poricha kootu by mixing with plain rice adding ghee. So I make this kootu slightly thin in consistency. Usually we make peerkangai kuzhambu and ridge gourd skin chutney / thogayal for rice. 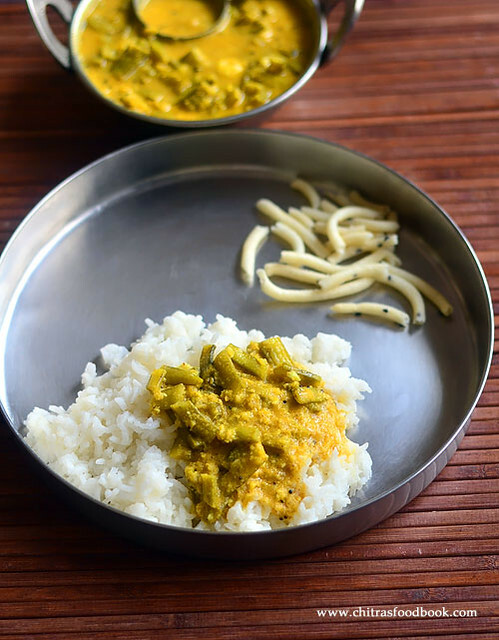 But when I was asking my MIL to teach some new recipes using ridge gourd, she suggested this easy poricha kulambu recipe that can be prepared directly using a pressure cooker. Friends, do try this easy peerkangai poricha kuzhambu for a change. You will love it for sure. I have used moong dal / Paasi paruppu in this kootu. 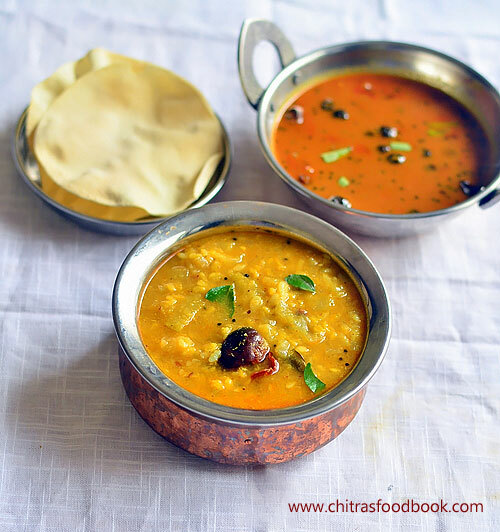 You can also use Chana dal/ Kadalai paruppu just like hotel style kootu recipes. It tastes good for vatha kuzhambu and Kara kuzhambu. 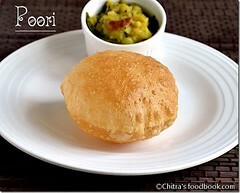 If you like, you can have it with chapathi too. Lets see how to make this easy peerkangai kootu in pressure cooker with step by step pictures. 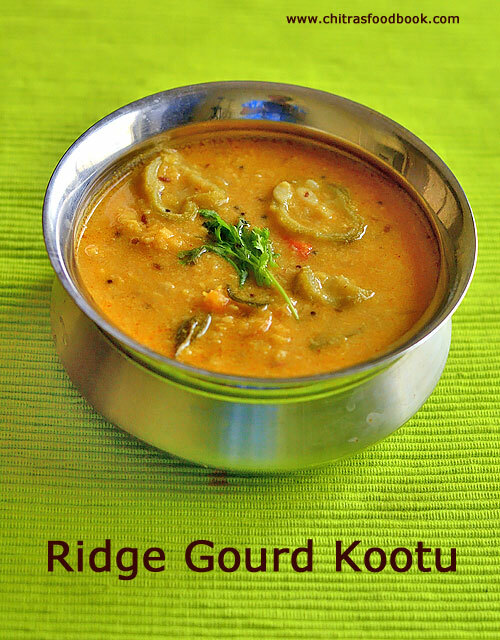 Check out Andhra style Ridge gourd dal, Ridge gourd Kuzhambu , Turai Ki Sabji for Chapathi. 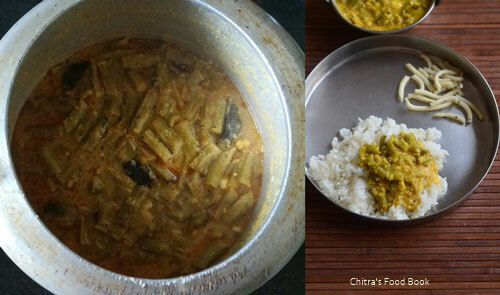 Peerkangai Kootu Recipe / Ridge Gourd Poricha Kootu using a pressure cooker - Side dish for Vatha kuzhambu and Kara Kuzhambu. Wash and peel the skin of ridge gourd. Slice it. In a pressure cooker, temper and saute onion, tomato. Add chopped ridge gourd, moong dal, sambar powder, turmeric powder and salt. Grind coconut+rice flour+cumin seeds to smooth paste. Add to ridge gourd. Pressure cook in low flame for one whistle. 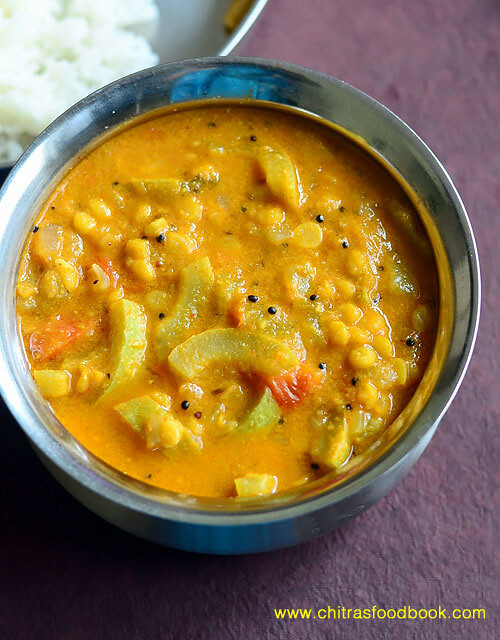 Serve with rice or as side dish for vatha kuzhambu and kara kuzhambu. Wash and peel the skin of ridge gourd using a peeler. Chop into thick round shaped slices. Set aside. If you are using chana dal instead of moong dal, soak it in enough water for 30 minutes before cooking. No need to soak for moong dal. In a pressure cooker base, heat coconut oil. Splutter mustard seeds, urad dal, cumin seeds and curry leaves. Saute onion till transparent. Add tomato and saute till mushy. Add the chopped ridge gourd and saute for a minute. Add moong dal , salt, turmeric powder and sambar powder. Saute quickly and add 1 cup of water. Let it boil in low flame. In the mean time, grind coconut + rice flour to a smooth paste. Add the coconut paste to the boiling kootu in pressure cooker. Close the cooker and pressure cook in very low flame for one whistle. Open the cooker after steam is released. Mix well and check the consistency of kootu. 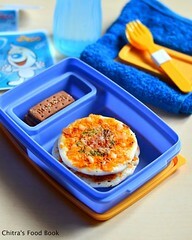 If its too thick, add little water and mix well. If its too thin, boil for some time till thick. Serve with rice. For variations, you can use red chilli powder + dhania powder 1 tsp each instead of sambar powder. You can make the same kootu using snake gourd, bottle gourd. 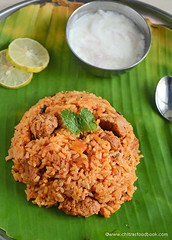 Try this easy, yummy peerkangai kootu for rice and enjoy ! I enjoyed it by mixing this kootu with plain rice and ghee. 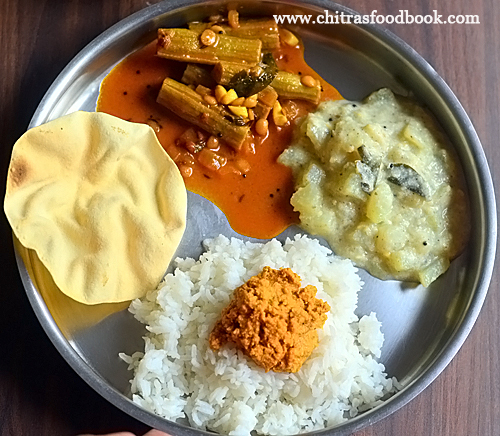 In the plate, you can find cabbage curry, goosberry thogayal and microwave roasted papad. Vazhaipoo kootu / Banana flower kootu/ Plantain flower kootu is my recent try in vazhaipoo recipes. I followed my MIL’s South Indian, Tamil nadu style basic kootu recipe with some modifications and tried it. It came out very well. 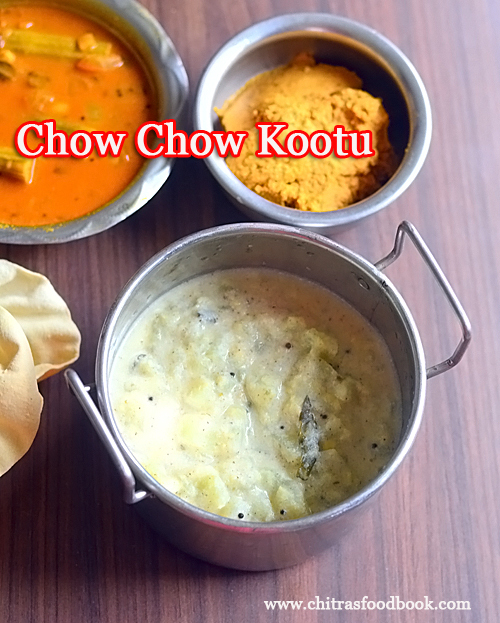 Its a very simple kootu recipe that can be prepared in a pressure cooker directly. It can be prepared under 15 minutes if you have cleaned banana flower ready in hand. 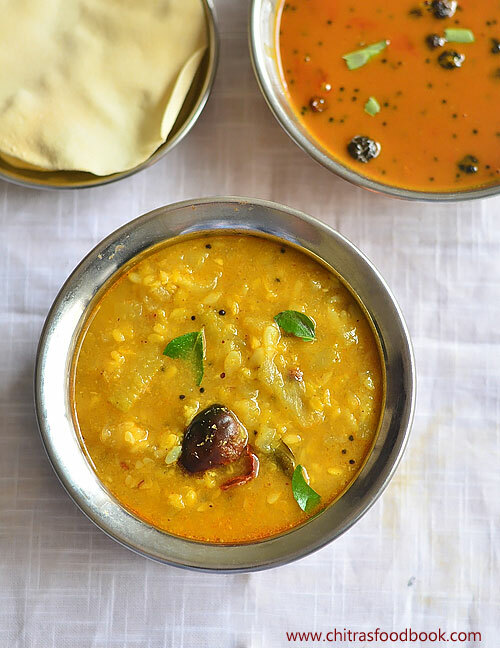 Banana flower, moong dal, sambar powder and coconut are the main ingredients in this recipe. I am happy that I got an easy, yummy recipe with banana flower other than my usual vazhaipoo vadai, vazhaipoo poriyal and vazhaipoo dosa. My MIL makes vazhaipoo/ vazhaithandu mor kootu. Soon I will share that recipe too. Now lets see how to make South Indian, Tamil nadu style Vazhaipoo kootu recipe with step by step pictures. Wash and clean the vazhaipoo florets. Chop into small pieces and immerse in buttermilk. In a pressure cooker base, heat coconut oil. Temper it. Saute onions. Add chopped vazhaipoo, tomato, moong dal, sambar powder, turmeric powder, salt. Grind coconut, rice flour to paste. Add to the kootu. Add water, pressure cook for one whistle in low flame. Remove the lid. Mix well and check for taste. Add more salt and some water if needed. 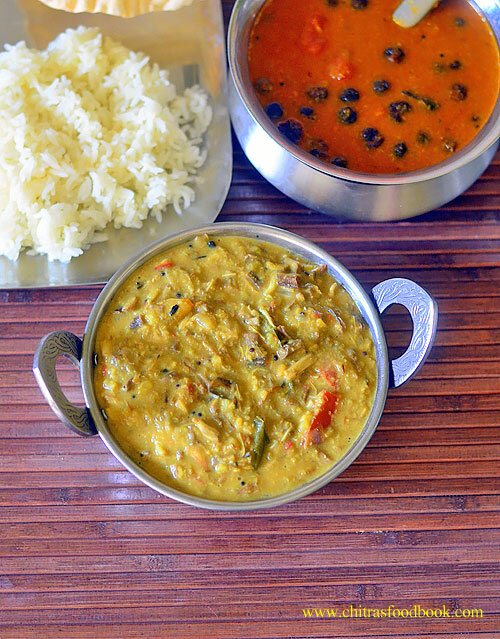 Serve with vatha kuzhambu, kara kuzhambu and curd rice. Wash and clean the banana flower florets. 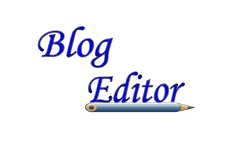 Please check this post for how to clean vazhaipoo. Chop the vazhaipoo into small pieces. Keep them immersed in buttermilk till use to prevent blackening. Heat coconut oil in a pressure cooker base. Temper mustard seeds, urad dal, cumin seeds and curry leaves. Saute onions till transparent. Add chopped vazhaipoo, tomato pieces, moong dal and saute for few minutes till vazhaipoo shrinks a bit. Add sambar powder, turmeric powder, salt. Mix well. Grind coconut + rice flour to a smooth paste. Add 1 cup of water, coconut paste and mix well. Pressure cook for one whistle in very low flame. Open the cooker after the steam is released. Mix well and add some water if the kootu is too thick. Suppose if the kootu is watery, boil for some time till thick. Mix well and serve with vatha kuzhambu rice, kara kuzhambu or curd rice. If you like, you can mix this kootu in plain rice adding ghee. Adjust the quantity of sambar powder for spicy taste. To replace sambar powder, use red chilli powder + coriander powder. 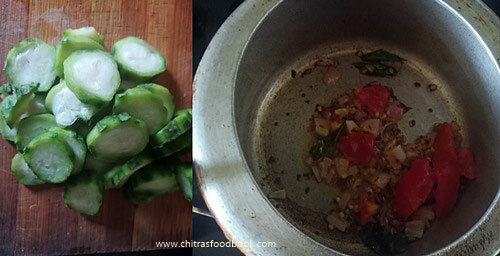 You can also saute one red chilli while tempering for more spicy taste. Do not reduce the quantity of coconut and tomato because vazhaipoo may taste slightly bitter based on its variety. You can replace moong dal with soaked chana dal or soaked toor dal. To replace tomato, you can add 1/2 tsp of tamarind extract too. You can follow the same recipe and use banana stem/ Vazhaithandu instead of vazhaipoo. Easy, healthy Vazhaipoo kootu for rice is ready. I served with Hotel style Kara kuzhambu. It was yum ! 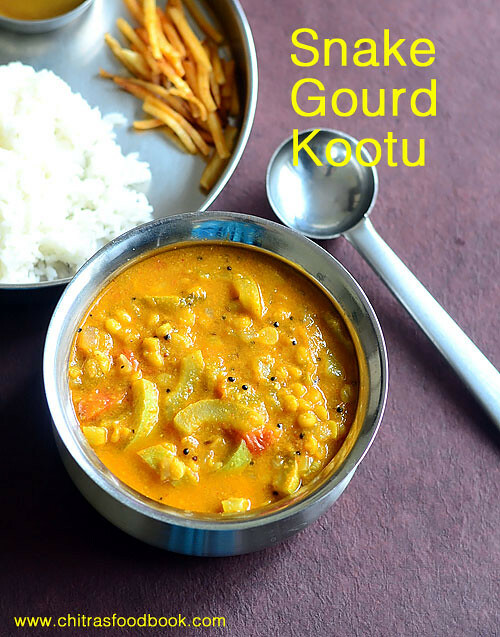 Sorakkai kootu / Bottle gourd kootu for rice is an easy to make, yummy South Indian style kootu recipe with coconut, moong dal. We call it as sorakkai poricha kuzhambu too. I make it as side dish for vathakuzhambu. Long back, I had shared my MIL’s sorakkai paal kootu and sorakkai sweet kootu recipes. Recent days, you would have seen me making all my kuzhambu, poriyal and kootu recipes prepared using pressure cooker easily. For this recipe too, I have used my pressure cooker to ease my job. It came out very tasty and flavorful. 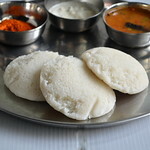 I loved it with vathakuzhambu rice and curd rice. For variations, you can use chana dal instead of moong dal like hotel ones. Friends, do try this easy, healthy bottle gourd kootu at home and share your feedback with me. 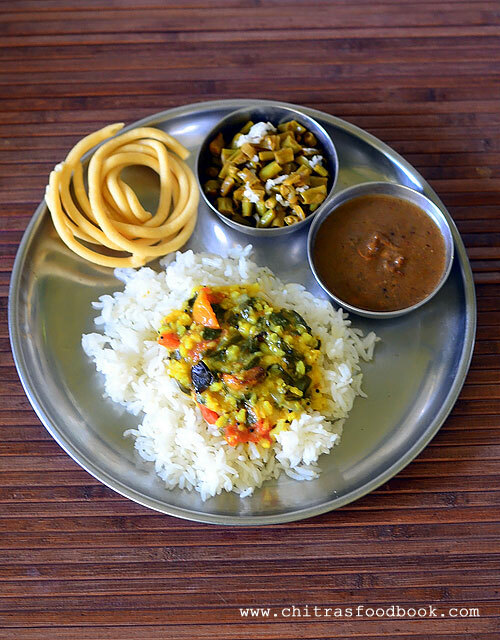 Lets see how to make Sorakkai kootu for rice with step by step pictures. 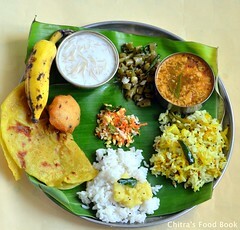 Check out my sorakkai sambar, sorakkai paal kootu, sorakkai dosai too ! Wash and peel the skin of bottle gourd. Chop into small cubes. 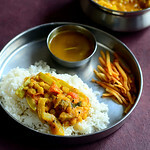 In a pressure cooker base, temper and take the chopped bottle gourd, moong dal, turmeric, sambar powder, salt and water. Mix well. Grind coconut + rice flour, cumin to smooth paste adding water. Add the coconut paste to the cooker. Cover and cook in very low flame for 2 whistles. Open the lid after steam is released. 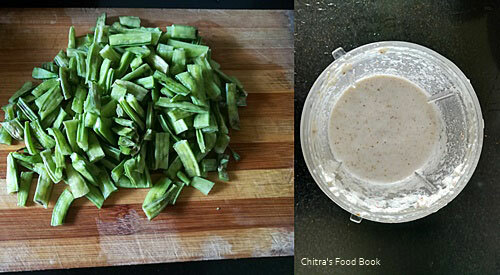 Wash and peel the skin of bottle gourd/ Sorakkai. Cut into two halves.Now remove the spongy center portion which has seeds.Chop the hard portion into small cubes. Set aside. Grind coconut, rice flour, cumin seeds to smooth paste adding required water. Keep it apart. Pressure cook in very low flame for 2 whistles. Open the cooker after the steam is released. Mix & check for taste. Add more sambar powder & salt if needed. 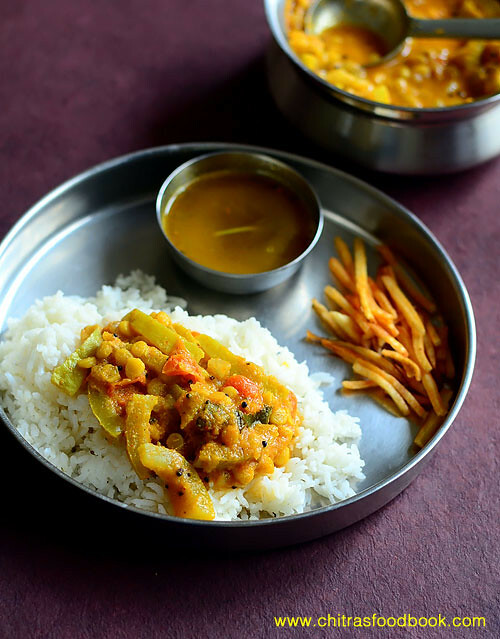 Serve hot with plain rice or vathakuzhambu rice. 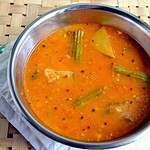 Adjust the quantity of sambar powder as per your taste and spice level. 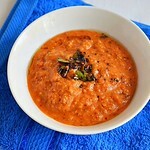 You can use 1/2 tsp of red chilli powder and 1 tsp of dhania powder instead of sambar powder. For variations, you can skip cumin seeds while grinding. You can also do the tempering at the end. 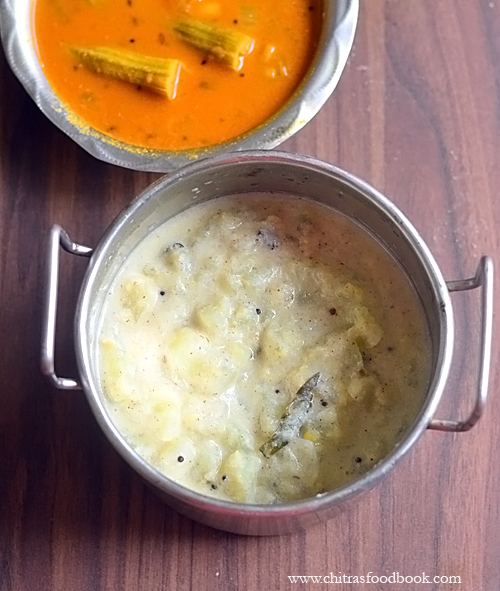 Try this easy, yummy Bottle gourd kootu in pressure cooker and enjoy with rice ! Kothavarangai kootu recipe / Cluster beans kootu (Gawar Ki Phalli sabji in Hindi) is an easy, healthy side dish for rice.We call this as Kothavarangai poricha kuzhambu in Tamil. We make it as a gravy and eat it by mixing with plain rice adding ghee.We serve with puli kuzhambu too. Usually I make kothavarangai sambar or poriyal. But recently I started making this kootu learning from my MIL. 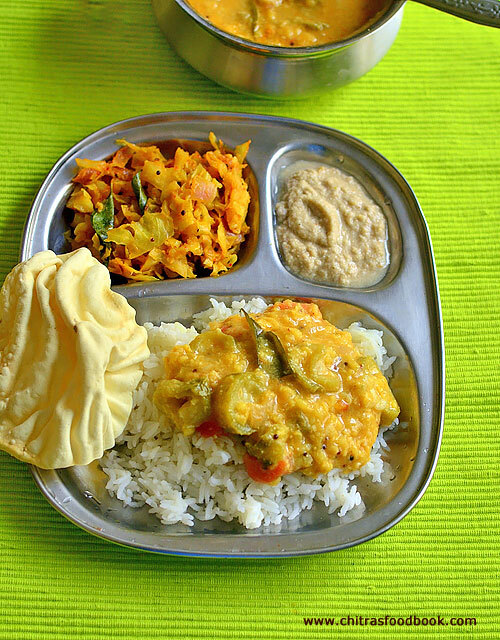 It is prepared with cluster beans, moong dal, tamarind sambar powder and ground coconut paste. We love its taste and flavor. To make my job simple, I make this kootu directly in a pressure cooker. So this side dish for rice can be prepared under 15 minutes. 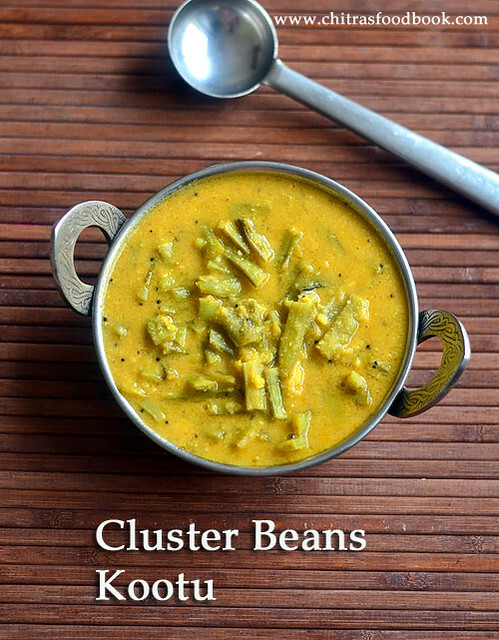 Do try this healthy cluster beans kootu at home and enjoy with plain rice & ghee. Lets see how to make kothavarangai poricha kuzhambu with step by step photos ! 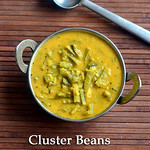 Cluster beans/ Kothavarangai - 20 nos. Tamarind or tomato - small piece( 1/2 tsp extract) / 1 no. Wash and chop cluster beans into 1 inch size pieces.Grind coconut, onion, cumin seeds to a smooth paste and keep aside. In a pressure cooker base, heat coconut oil and splutter mustard seeds, curry leaves. Add the chopped cluster beans and saute for 2 minutes in medium flame. Add 1 cup of water, turmeric powder, sambar powder, moong dal, tamarind extract or chopped tomato and ground coconut paste. Mix well. Pressure cook in very low flame for 2 whistles. Open the lid after the steam is released. Mix well and check for thickness. If the kootu is very thick, add 1/4 cup water, mix well and boil for a minute. If its watery, boil for 2 minutes till kootu becomes thick. 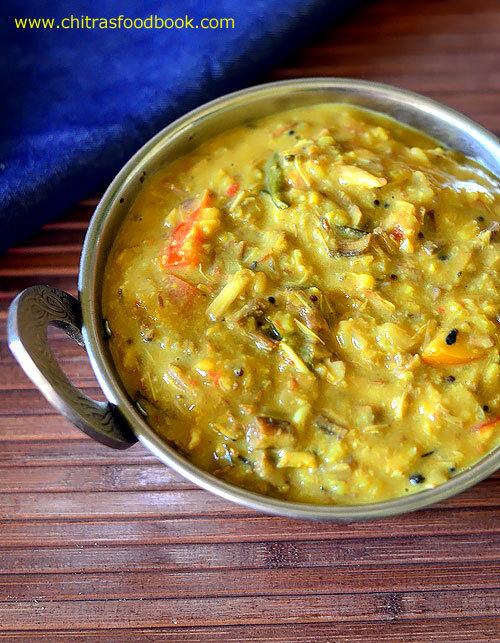 Serve this kootu with puli kuzhambu or vatha kuzhambu. You can mix this with plain rice adding a tsp of ghee. Tastes great ! If you don’t have sambar powder, you can replace with 3/4 tsp red chilli powder and 1 tsp dhania powder. You can also use one tomato ( finely chopped) instead of tamarind extract. Addition of cumin seeds & onion for grinding adds a nice flavor to this kootu. So do not avoid it unless you make a no onion no garlic kootu. Use chana dal instead of moong dal for variations. 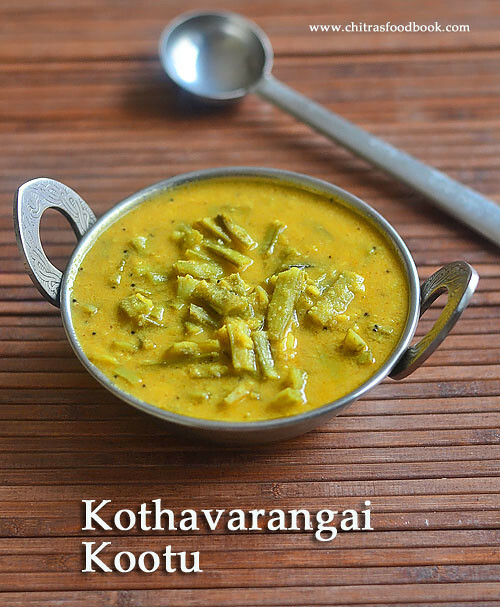 Try this easy kothavarangai kootu and enjoy with plain rice or vatha kuzhambu !